As the weather starts to get chilly and pumpkins seem to be congregating on every corner, this vegan pumpkin cupcake recipe will satisfy the heartiest fall sweet tooth. 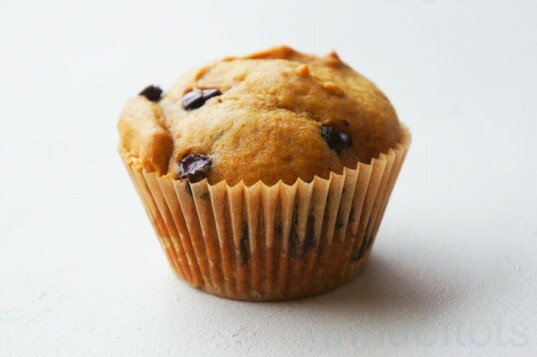 Show your appreciation for pumpkins and all of nature’s bounty with this amazingly delicious and easy-to-make recipe for vegan pumpkin chocolate chip cupcakes that will impress all of your friends, vegans and non-vegans alike. 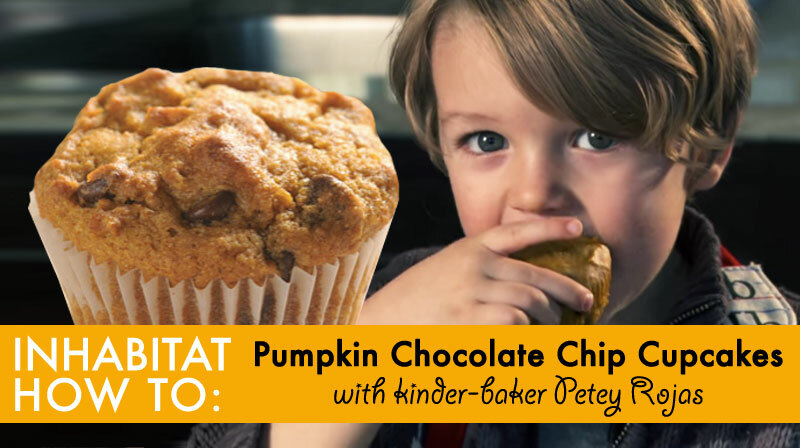 This recipe is so simple and easy that even a 3-year-old can do it – as evidenced by the video above. 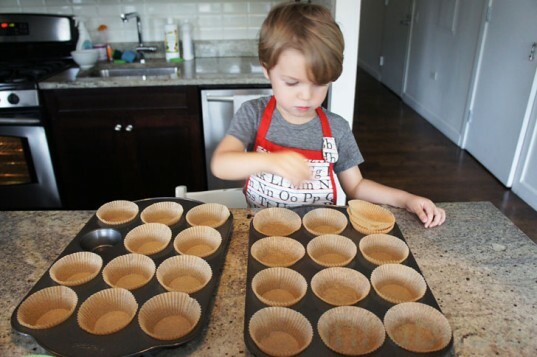 Baking vegan cupcakes makes a great project for the pre-K set – with a little adult supervision of course. Without frosting (my preferred way of enjoying them), these cupcakes might be more aptly described as “muffins,” but they are majorly tasty and so scrumptiously sweet that they really don’t need the additional sugary slather on top. However, if you are a sucker for the sweet stuff, authors Isa Chandra and Terry Hope provide instructions for a cinnamon icing to accompany these cupcakes in Vegan Cupcakes Take Over the World (a book I highly recommend as a gift for the upcoming holiday season). Line a muffin tin with eco-friendly (unbleached) cupcake liners. In a medium mixing bowl, mix together the canned pumpkin, oil, soy milk, sugar and vanilla. When this is thoroughly mixed, sift in the flour, baking powder, baking soda, cinnamon and salt. Use a fork or whisk – not an electric mixer. Pour batter into the muffin tin – filling each space about 2/3 full. The cakes will rise a lot, so don’t overdo it unless you want gigantic cupcakes. Bake at 350°F for 22 minutes. Let cool before you eat them. Enjoy! This is one of the cutest things I've ever seen!!! Petey you're a star! Mmm. def gonna try this. It would be a great Thanksgiving dessert! One of the best and cutest baking videos ever! Petey needs to open his own bake shop! OMG! Call the Food Network! Petey needs his own show! This is just precious. Seriously this kid is not only adorable but also super talented. Go Petey! Does this recipe use 2c brown sugar or granulated sugar? The video says brown sugar and the recipe written below says granulated sugar. Thanks for the help! Hi Meagan- I think we've literally used both granulated sugar and also brown sugar on occasion, and they turn out about the same either way. The official recipe from 'Vegan Cupcakes Take Over The World' says to used granulated sugar. Hope that helps. As the weather starts to get chilly and pumpkins seem to be congregating on every corner, this vegan pumpkin cupcake recipe will satisfy the heartiest fall sweet tooth. Show your appreciation for pumpkins and all of nature's bounty with this amazingly delicious and easy-to-make recipe for vegan pumpkin chocolate chip cupcakes that will impress all of your friends, vegans and non-vegans alike. 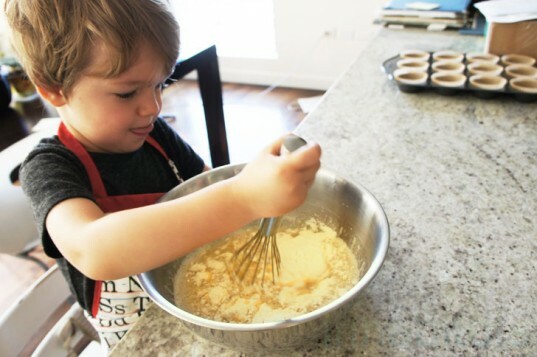 This recipe is so simple and easy that even a 3-year-old can do it - as evidenced by the video above. Baking vegan cupcakes makes a great project for the pre-K set - with a little adult supervision of course. Without frosting (my preferred way of enjoying them), these cupcakes might be more aptly described as "muffins," but they are majorly tasty and so scrumptiously sweet that they really don't need the additional sugary slather on top. However, if you are a sucker for the sweet stuff, authors Isa Chandra and Terry Hope provide instructions for a cinnamon icing to accompany these cupcakes in Vegan Cupcakes Take Over the World (a book I highly recommend as a gift for the upcoming holiday season).